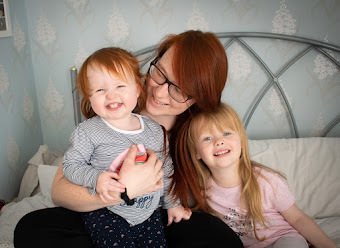 It feels like yesterday that I gave birth to my gorgeous blue-eyed little monster, and now she is three, I can't believe how fast the time goes, and how much she has grown, changed and developed her own little personality in such a short space of time. Shes, not a baby anymore, she is a little kid, and I couldn't be more proud of her. This year on the run up to her birthday, she was super excited. She kept asking her dadda and I how many days it was until her birthday. She knew that she would have presents, cake and candles - something she didn't really understand or get excited about last year. It made the whole day so much more special. When you become a parent their happiness is your happiness and seeing that big smile on their face is all that you care about. I wanted to make this birthday really special, every year we get her a numbered balloon and set out her presents, but this year she asked for party hats and I wanted to make a real fuss of her. It's been a weird three months since her sister has been born, lots of our focus has been on Isabelle and she's been a champ, she has adjusted really well and taken it all in her stride. With that in mind, I really wanted her third birthday to be something she would remember and talk about for days and months to come. Emily has recently become a little bit obsessed with Trolls. When I say a little bit I mean a lot, she watched it 8 times in a row, asks for the soundtrack to be put on in the car, knows all the characters names and most of the words for the songs. Just a week before her birthday she asked for a Trolls birthday, of course like any other Mama you want to give your child what they want, and I managed to pull it out of the bag luckily. I ordered some personalised trolls birthday banners for Emily, along with a tablecloth, some party plates and hats. She also had the most gorgeous Poppy cake. Sam and I managed to get her a poppy balloon, as well as her number three balloon (that she has every year). Her face in the morning when she woke was a picture, she kept saying 'oh for me, it's so wonderful'. I'm sure she spent the whole of her birthday saying thank you, and she had a smile permanently on her face all day. Emily didn't really want anything big for her birthday this year, she just wanted some little figured and quite a few small things like kinetic sand, playdoh, and games. So it did look like she got quite a lot for her birthday, but it was just because she had small toys instead of something big. Isn't it funny how when they get older, the presents get smaller? Emily was delighted that I managed to get her the Miffy figures, and also the Teletubbies Superdome that she had been asking for. We opened gifts and ate breakfast before grandma came around with her presents. Emily was so happy to just play with all her toys and didn't really want to do anything on her actual birthday. The weekend before her birthday her Nan, Grandad and Bobby came down to stay and she went to the cinema and out for a meal, plus lots of other fun things. It was actually her first ever cinema trip, (you can read about that here) we had planned to do a little tea party for Emily, as she requested a 'picky dinner' which she was really looking forward to. Her godmother also came around for her little tea party, which added to the excitement for Emily. I made some of her favourite picky foods, such as chicken nuggets, sausages and some white chocolate fingers. Happy birthday Emily! it looks like she had a wonderful day! its so scary how quickly time goes and they suddenly become little people!